It’s time for another Michael Bay film. This one is a disaster film so you can bet that there are a lot of opportunities for explosions. Like most action blockbusters that are over 2 hours, the film starts to fade by the end despite a reasonable start. Still, that’s not the area to blame in this case. It’s the characters and the writing that really keep the film down. It’s not like you’d expect too much ever since the Transformers series went public and people found out about the writing quality but you still always hope for the best when starting the film. Ah well, at least the explosions will keep you guessing. The film starts off in NYC as a guy is trying to walk his dog while insulting everybody. The Dog attacks a guy’s Godzilla collection and starts to rough the Kaiju up. This leads to a confrontation between the man and the owner of the dog, but the man is blown up by a meteor. Not gonna lie, that scene was pretty hype since it’s just not something you’d expect in a film that isn’t about aliens and super powers. We learn that these shards are hitting various places on the planet because a big meteor is coming that will destroy the world. The government is forced to call in a team of drillers so they can teach them how to be astronauts and send them to the meteor where they will drill inside of it, drop the nuclear bombs, and get out of there. This can’t go wrong! I remember reading way back in the day about how one of the main actors asked Michael Bay if it would be simpler to just teach the Astronauts how to drill than the other way around. The response he got was a very direct No. Still, I have to agree with the sentiment since it doesn’t seem like the drilling is all that hard. I mean…it’s just drilling right? Not to trivialize it or anything, but they had 2 weeks to prep anyway. Instead the drillers use that 2 weeks to mess around and go to clubs. Not the most productive way to go about things and I can see why the army lost their patience with them. The fate of the world is at stake and they still can’t get serious. We actually get a Suicide Squad esque montage where we meet all of the characters. Naturally the very first member we see is trying to evade the cops and does a pretty good job of it. They have 2 copters after him and a dozen cars, but he’s still escaping. Another one is on his horse…riding away from th cops. Another one’s in a shady bar and you get the idea. These are the best of the best, but they’re all criminals so can they really be trusted with matters of National Security? They’re not doing this out of the goodness of their hearts either as they want to stop paying taxes and be able to visit the White House as part of their terms. I’m assuming they won’t get these rewards or at least hopefully not. Honestly, I’d at least want a big chunk of money as payment for saving the world though. That seems pretty fair if you ask me. The first bit of the movie is actually really solid. We get to see inside of the government base as they all talk a good game and posture quite a bit. The dialogue is witty but not over the top and exaggerated. The characters are tough and rough without being annoying. These guys are professionals and act the part. We also get some nice destruction scenes in New York as we see people falling to their doom when buildings break and it may have even looked more impressive here than in Batman V Superman which is saying something. The film really only breaks down the instant we meet the main characters. That’s when you know that trouble is on the horizon. We go to a drilling boat where Harry, the lead driller is playing golf. His team has been polluting the ocean for years under the cover of corporate business and he is casually hitting protesters on the head with his golf balls. Then he realizes that his subordinate AJ isn’t around and unfortunately he has been fooling around with Harry’s daughter. This is a very sad way to introduce these two characters, but it’s unfortunately not unexpected. AJ quickly runs out of there while Harry grabs his shotgun and tries to shoot him. It’s a very surreal scene as Harry runs around the ship shooting holes everywhere and sabotaging millions of dollars in the process. All that and he only gets a grazing shot on AJ’s leg. Naturally there are quite a bit of tensions between them now but they’ll have to team up if they want to save the world. AJ is clearly not going to stop going after Harry’s daughter so now Harry will have to either accept it or cut AJ’s air supply once they hit space. He’ll have some pondering to do. Michael Bay films always suffer from 3 major problems. A nonsensical plot filled with many holes and characters making bad choices, terrible writing where every character has a potty mouth, and going for a lot of fanservice scenes that do nothing to add to the plot and are just there to doom the movie. While we mostly avoid the second option the others are still around for the duration of the movie. We didn’t need to have another scene that takes place in a shady strip bar where the characters prove that they are using their money in the worst way possible. One guy borrows millions of dollars just so that he can stay there for a full day before likely going off to die and that way he won’t have to repay the money. He also goes crazy in space and tries to murder everyone, but the characters wave that to the side and don’t mention it to the people on Earth. Now this crazy attempted murdered will be on the loose until he cracks again. That’s not cool. The plot between Harry and his daughter Grace also isn’t handled well at all. You can definitely see why he’s upset since she’s been hiding her relationship with AJ for 5 months. I don’t know how though since they have so many public displays of affection that Harry must be really dense. Even when it’s mission time and AJ has to go we have to waste 5 minutes as he goes through an entire song in slow motion with large breaks between the lyrics. If you want a good example of a bad romance, this is it. It’s absolutely terrible and considering that the whole team has no sense of morality I’d want Grace off the ship if I was Harry as well. Every time one of the team comments about Grace’s looks you want Harry to grab the shotgun again. Naturally this doesn’t make me like AJ any better as well. He’s willing to sacrifice the mission just to show off and never gets me to change my opinion of him. At least Harry was usually a good character and he’s the only member of the team that was actually decent. He makes the tough calls when necessary and is also the only one who seems to want to save the world. He has no demands upon doing it, he’ll just save the world to save his family. It’s a shame that the whole crew couldn’t be like Harry. As for the plot getting a little iffy, why on Earth would the government try to blow up the bombs early when the characters still had time? They know that blowing up the bombs at that point would do nothing to stop the meteor from heading their way so it’s a waste of time. It would also blow up the only people who even gave them a chance at saving the world. It was only added into the movie to be used as pure drama and that’s why you should never do something purely for the rule of cool. You have to keep the plot in mind at all times. The film also seemed to want to stretch itself out for no reason like when the heroes stop at a convenient Russian rest station in space. Okay…then the place starts to blow up so they head back to the ship. This entire scene was completely filler and adds nothing to the movie. It’s just there for more explosions I guess, but it’s a rather long detour from the main plot. The scenes in space also just aren’t as fun as the ones on Earth. Everyone starts to blend together since they’re wearing the costumes and all of the scenes start to look the same. It’s just more and more space with nothing really happening. They finally get the drill going and leave, but the final act is a little on the slow side. The first act wasn’t good since the main characters were so bad, but at least it was fun. You can’t really say that about the end. The humor is pretty hit and miss as you’d expect. Some jokes are really good and others are quite forced. Attempts were made though so I’ll at least give it credit there. 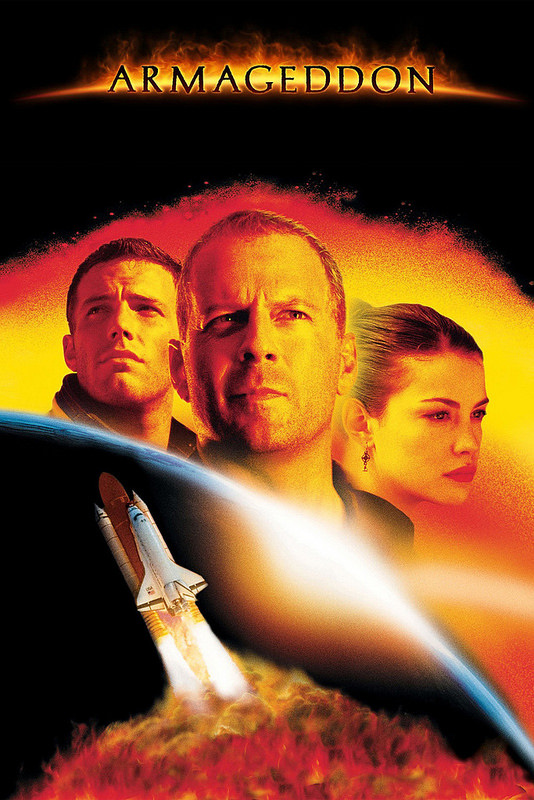 Overall, Armageddon is one of those films with a great concept and a poor execution. The film shows glimpses of greatness such as all of the scenes without the main character. The film is solid up until the first scene where AJ appears, gets good again from the point where Harry leaves for the base and gets debriefed. It sinks again when we get the montage of the other characters and just doesn’t rise up from there. It’s a fun film and the pacing is good for half of it, but there are simply too many negatives to recommend this film. I’ll give it some kudos for keeping the dog alive in the first scene though. I was ready to hit the panic button but the film kept its class there. If you want a lot of explosions and really annoying characters then this is the perfect film fr you. If you want a hype action film with better characters then I would recommend Batman V Superman instead. That one will be right up your alley. This entry was posted in Live Action Movie Reviews, Live Action Movies, Reviews and tagged Action, Armageddon, Ben Affleck, Bruce Willis, Disaster Film, Film Review, Michael Bay, Movie Review, Review, Thriller by dreager1. Bookmark the permalink. Batman v Superman had it’s faults, but I still preferred it over this film. I too agree that training astronauts to drill should be easier than the other way round.